On Sunday, January 23, 2011 at 10.30 am when Hon'ble PM Manmohan Singh arrived in the Central Hall of Parliament to celebrate 114th birth anniversary of Netaji Subhash Chandra Bose, the firebrand leader who ignited a spark of fierce patriotism in the heart of every Indian, he found perhaps more to his embarrassment than surprise just five people beside the portrait of Netaji. The man who had once boiled the blood of his countrymen by his supreme sacrifice for the independence of India failed to fight the ‘cold weather’ of Delhi. What a pity! I am deeply distressed, first as a school-mate of this giant who studied in Ravenshaw Collegiate School in Cuttack, Orissa and completed matriculation in 1913 securing highest marks in all the subjects and standing first among the students of Assam (consisting of all the present day seven states), Bihar, Bengal and Orissa under Calcutta university and secondly, for his supreme sacrifices for the cause of India. Very rare, indeed. When many leaders simply invested during the freedom movement, here was one who let go every thing, including his life. While I was a student in Cuttack, K M Munshi had come in 1957, perhaps from Delhi, to Cuttack to celebrate Netaji’s birthday. We stood hand-in-hand to honour Munshi ji. And on Sunday leaders could not leave their cosy beds in New Delhi! Subhash was greatly influenced by Bal Gangadhar Tilak and Aurobindo. He was spiritually inclined and looked upto Swami Vivekanand for inspiration. In 1921 he qualified for coveted ICS exam with 4th rank. But disturbed by Jallianawalla Massacre, he left the ICS internship midway and sailed to India. But as the ship was nearing Bombay, he tore off the ICS certificate and threw into the water. When he joined Congress, Mahatma Gandhi advised him to work under Deshbandhu Chittaranjan Das, whom Netaji accepted as his political guru. Netaji was Congress President during 1938 and again in 1939 by defeating Pattabhi Sitaramayya. Leaving the jail in disguise he traveled to Europe to meet Hitler, then moved to Japan to form Indian National Army (Azad Hind Fauz), took over the command from Rash Behari Bose, and attacked the British India. INA crossed Burma border and stood on Indian soil on March 18, 1944. This great star soon vanished from the Indian sky in 1945, and no body for sure knows where and how. Yet, the very name of this nationalist invokes great reverence in every heart. His sacrifice can be compared with that of Karna in the Mahabharat. He lost his life, but has won every body’s heart. ‘Delhi chalo’, ‘Delhi door nahin’, ‘Vande Mataram’ and 'Jai HInd' are the slogans of this apostle of patriotism. Bengal celebrated it as 'Desh Prem Dibas' (Day of love for nation). 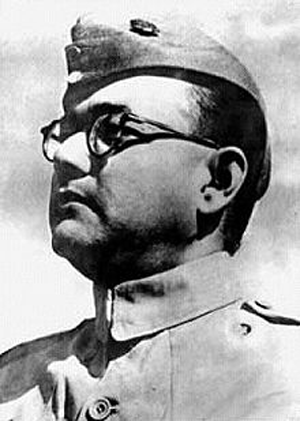 In words of Subhash Bose, Nationalism is inspired by the highest ideals of the human race, Satyam (truth), Shivam (god) and Sundaram (beauty). Nationalism in India has aroused creative faculties which for centuries had been lying dormant in our people.' May Netaji's immortal soul inspire us in India for ever.